James Sullivan was in Moscow for last month’s World Championships and gives his own personal review of the event. In the last of three parts, he gives an account of how the world’s media tried their hand at 800m running, delves deeper into the doping controversy overshadowing sprinting in recent months, and speaks about the inclusiveness of Moscow 2013. In total there were approximately 3,000 media accredited guests in Moscow. Countless hours are spent interviewing athletes, reporting on the success of the victors, while sometimes commenting on the underperformances of others. Members of the media like to give off the idea that they are experts in what they write about, something which I have sadly come to realise is complete fantasy in a lot of cases, but can they follow their own documented advice? Can they practice what they preach? The answer is an emphatic “nyet”. In every edition of the World Championships since Rome in 1987, the IAAF have organised an 800m media race, open for any member of the hard-working, coffee swilling press, and Moscow 2013 was to be no different. 118 of the world’s most finely tuned journalists congregated on the Luzhniki Stadium to do battle over two laps of the track during the downtime between morning and evening sessions on Thursday 15th August. The event was split into 13 heats, supposedly graded based on personal bests, with the results merged at the end to determine the prize winners. If the above sounds even semi-serious, then I can assure you this was not the case. While there were some respectable times recorded, the event was more about having a bit of fun and getting some media members involved in extra-curricular activities, rather than staring into a bright screen from morning to night. There was one woman who took over six minutes to complete the distance, a man who ran with a high-tech sports camera over his shoulder, another in full denim jeans, and my compatriot, Cathal Dennehy, who donned some worn out road running shoes and floppy shorts, hadn’t set foot on a track in years, and didn’t even bother to warm up, yet finished in third place overall in a steady 2:05, for his efforts receiving a watch valued at $400 from none other than double Olympic silver medallist Yohan Blake. In stark contrast, I actually opted to train specifically for this distance in the weeks leading up to the World Championships. While I am not much of a runner, and 800m is not my favoured event by any means, the thought process was that one does not often get to race on such a perfect track in a large, albeit completely empty, stadium. Sadly, the race itself didn’t go to plan, as a week of sickness knocked any sort of strength out of my body, and I limbered home to a poor 2:21 and 19th place overall. 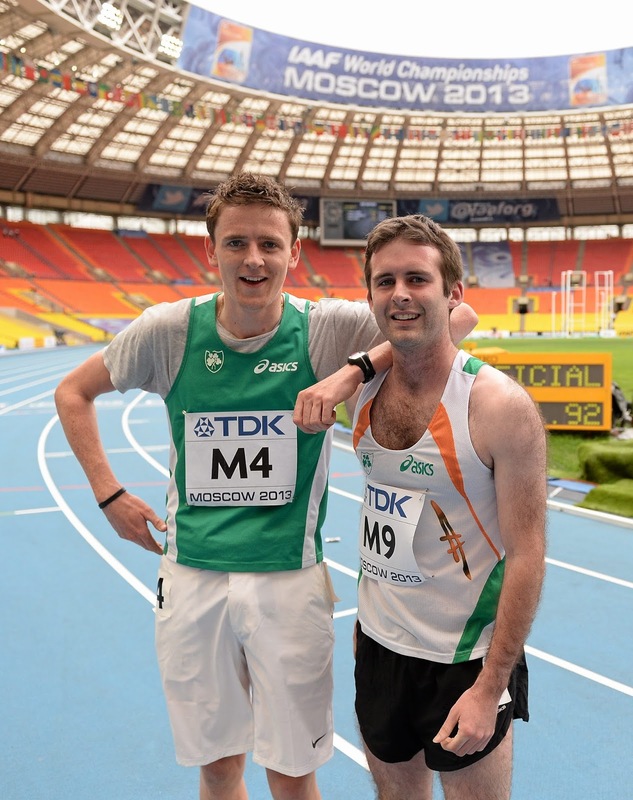 Moments later Cathal and myself, both donning official Irish vests, were cornered by the good folk at Flotrack and requested to give an interview, resulting in my overjoyed team mate declaring that I had disgraced the Irish singlet. It was hard to disagree, and to be fair this level of banter just summed up the whole occasion. It is no exaggeration when I say that this race was one of the most enjoyable parts of the entire week. It was a surreal experience having Yohan Blake as the official starter for each heat, and 800m silver medallist Nick Symmonds watching on intently. While I am sure I will run much quicker in the future, it is difficult to envisage having quite as much fun in the process. While I would never describe myself as a cynic, and indeed my belief has long been that athletics is a lot cleaner than the media give it credit for, and that it does infinitely more than higher profile sports to catch drug cheats, the fact still remains that there are some athletes involved willing to take a short cut towards success. With the recent doping scandals in the 100m involving multi-medallists Tyson Gay and Asafa Powell, it seemed appropriate that questions needed to be asked. Most journalists, however, shied away from such sensitive topics. It would be incorrect to say that drug related questions were forbidden, but they certainly were frowned upon, not so much by the organisers, but by certain athletes themselves, with mild groans and eyes reaching for heaven when the words “WADA” and “doping” were uttered. Instead we were treated to a barrage of thought provoking questions reflecting a new age of sports journalism. “Usain, would you like to be a professional footballer after you retire?” “Usain, what position would you play?” “Who is your favourite player?” “Can you tell us a little more about that chicken dance you perfected this evening?” To say this caused agony to the brain cells would be an understatement. Here we were in the press conference of an event which has had an enormous doping controversy of late, and all people cared about was child’s talk. Eventually my countryman, Cathal Dennehy, could no longer hack such mind-numbing dialogue and reached for the microphone. “Usain, would you be in favour of lifetime bans for drug cheats?” he uttered, to which he received the most politically correct rote learned answer you could imagine. “That’s not for me to decide, it’s for the people upstairs.” The following evening a similar question was posed to the three medallists in the women’s 100m, Shelly-Ann Fraser-Pryce, Murielle Ahoure and Carmelita Jeter, with the added query on their attitude towards the returning of prize money earned as potential punishment for serious doping offences. Ten seconds of awkward silence, eyes fixed firmly on the ground, before Fraser Pryce at least had the decency to attempt yet another unconvincing answer, mirroring Bolt’s reply the previous evening. This was in stark contrast to ten minutes earlier when New Zealand shot putter Valerie Adams was quizzed about her thoughts on the possible introduction of lifetime bans for drug cheats. What followed was a passionate rant about how doping has no place in sport, about how she has put several ounces of blood sweat and tears into the sport she truly loves. About how she can never forgive the Belarusian woman, Nadzeya Ostapchuk, for robbing her of a glorious and deserved moment of celebration in London last year. About how if it was up to her, athletes convicted of doping would never be allowed back in the sport. Her hand placed firmly on her heart, her eyes welling up, this was a reply which drew a rare round of applause in the press conference room. It is how you would expect a clean athlete to respond to a question about the most offensive act in the sport of track and field. I have no place to be making any specific public accusations, but the comments from the leading 100m runners, and general attitude and vibe that went with them, do little to convince the onlooker that the right moves are being made to stamp the cancer of doping out of the sport. Negative moments were a rarity however, and the championships overall were a big success. There had been criticisms early on with regards to low attendances, but once the event gained momentum there were close to 60,000 people in attendance every night, figures which very few other sports can attract to their showpiece event. A personal observation I made was that the Russian audience was actually quite knowledgeable about the sport, something which was completely lacking in Daegu two years ago. They recognised straight away, while in mid-air, if a javelin throw was poor, they knew if a Russian was fading on the last lap and was not going to catch the leading three, and they clearly deciphered that the first evening session had a dreadful line-up of uninspiring heats, and opted to wait for more exciting evenings to attend. They created an atmosphere, particularly the night of Yelena Isinbayeva’s victory in the pole vault, which has topped any other I have experienced in the previous three championships I have attended. Arguably the most important aspect of events like these is the opportunity to inspire future generations to take up the sport, to encourage kids to get involved, creating healthy habits which they can take with them throughout adulthood. Moscow 2013 came out with the highest grade in this regard. Outside the stadium were all kinds of interactive games and activities. There was a 30m temporary track with electronic timing for those who wanted to sprint, mini hurdles for the more adventurous, a long jump pit, javelins, hammers, you name it. There was a high jump bar set to the ridiculous world record of 2.45m, displaying clearly to the average person on the street just how good the world’s best are. There were coaching sessions teaching the proper technique of various events. Various high profile athletes such as Blanka Vlasic, Allyson Felix and Yohan Blake made regular appearances to sign autographs. It was everything which London 2012 wasn’t. It was far more accessible to the fans, the casual viewers and most importantly to the children of the host city, the future athletes of this great sport. To the organising committee, the volunteers and the people of Moscow, I think I speak for most media members when I say spasiba. This is part 3 of James’ review. Check out part 1 and part 2.